Light. Compact. For kids up to 20kgs. DescriptionConfotable for baby (with soft padded seat) and for parents (large wheels and adjustable handles) a sun XL canopy and reclining seat, this buggy will help enjoying your stay in Paris with baby. Footmuff added to delivery for free on request. Colour of delivered stroller may be different. See EasyWalker Mini Buggy XL stroller demo video here. 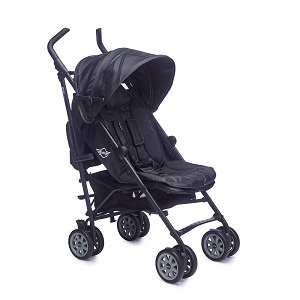 For visiting Paris with baby in its buggy, we've selected the EasyWalker Mini Buggy XL: padded soft seat, leatherette, high adjustable handles for parents confort, XL sun canopy that protects baby from sun and wind, delivered with a rain cover (of course!). This buggy is light and compact once folded, it will be easy to store in your hotel room or appartment, in a taxi trunk or when in restaurant. This buggy can suit a child up to 4 year old (20 kgs max). "This was our family's first trip to Paris with a 4-year old. While he is completely capable of walking on his own, we knew that he did not have the endurance needed for all the sightseeing we did each day. It was great to have the stroller conveniently delivered to our hotel and available for our outings. I highly recommend this company for families who want to travel without strollers on flights." "Wonderful experience. We rented a stroller and bathtub, and the whole process was very simple. Camille was very responsive and prompt with her replies. The delivery and pickup of the items was very seamless. Overall highly recommend this service."